A casual dining venue that serves a tantalizing selection of Chinese specialty cuisine day-and-night, Red 8 allows you to enjoy the best in Cantonese cuisine whenever the mood strikes, 24 hours a day. The restaurant offers a comprehensive menu featuring fried rice, noodles, soup, dim sum, and BBQ, sourced with a delectable array of sought-after ingredients. Watch expert chefs ply their trade in Red 8's open show kitchen, preparing tantalizing dishes like the restaurant's signature Thin-Framed Roast Goose, a feast of succulent dark meat and sweet, crispy skin. Whether you want a comforting breakfast, a delicious afternoon shopping break, or a tasty late-night bite after an entertaining evening out, Red 8 is ready whenever you are. 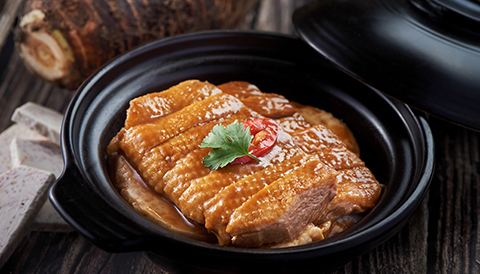 Enjoy a special menu of authentic Guangzhou cuisine, featuring goose, chicken, taro, dumplings, and congee, prepared delectably and accompanied by sweet sauces and a touch of fish or other seafood to enhance the fresh flavors.